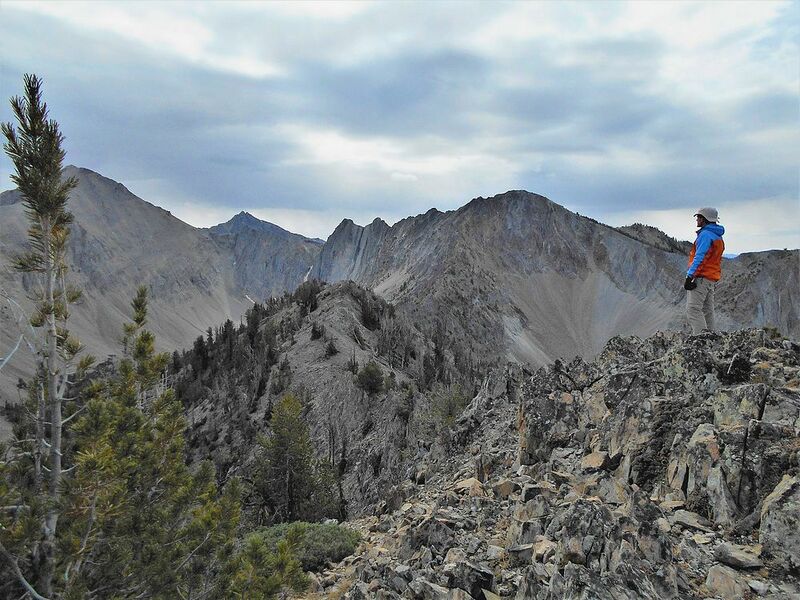 Central Idaho’s Cecil D. Andrus-White Clouds Wilderness is home to some amazing alpine terrain. There are many spectacular high mountain lakes, wildflower filled meadows, and numerous climbable peaks. A total of 38 peaks to be exact, according the Lists of John. When the wilderness area was officially designated in 2015, I became aware that I’d already climbed over 30 of the peaks in the wilderness, and set a goal to climb the rest. The final objective would be a mountain I have dubbed “Wilderness Peak” (Peak 9803’) in the northern White Clouds. Pat and I made the drive through Stanley on Sunday evening, and set up camp at O’Brien Campground, on the banks of the Salmon River just east of Sunbeam. Then next morning, we made the short drive to the trailhead near Robinson Bar Ranch, and started hiking at 7:30am. The trail initially climbs up the hillside to skirt around the private ranch property. It was a good way to warm up on a chilly October morning. Soon, the trail passed over a knob with a good view of the ranch, and then gradually descended down to Warm Springs Creek. The sizeable creek was very scenic. We made good time hiking up the valley, with only occasional pauses to try and stay on course. The trail was made long ago, but it is hard to follow in places since it is becoming overgrown due to lack of traffic. After almost 6 miles of fairy flat hiking (only 1000’ gain so far), we found ourselves at the toe of northwest ride of Wilderness Peak, and decided to stop for a snack break amongst the burned trees left from the 2005 Valley Road Fire. After the snack break, the climbing started in earnest, as we began the 3000’ of elevation gain needed to reach the summit it the next two miles. We dodged a few granite outcroppings down low, and then gained the more pronounced ridgeline. The climbing was mostly straightforward class 2, and we made a steady pace upward with only brief pauses to stop and enjoy the views (and catch our breath). Eventually we made the final push to the summit, and arrived at the highpoint to enjoy some great views. Most impressive was the rugged looking north face of White Cloud Peak #2. We also had good views of WCP-3, and WCP-1 as well. TO the north we could see the Salmon River Mountains, and parts of the Sawtooths visible to the west. All in all, a great place for a lunch break. Soon enough we would need to head back down. Needing to hike 8 miles back to the car, we still had some ground to cover! But fortunately, we just had to retrace our path, with very little difficulty. The ridge descent was pleasant, and then we enjoyed a long but scenic trail hike back, next to the beautiful Warm Springs Creek. It was very satisfying to climb my 38th and final peak on the White Cloud Wilderness Area. And it was quite possibly a first ascent of the peak, given the remote and obscure nature of the mountain. Pat was great company, and we enjoyed swapping stories along the way. Round trip was 16 miles, 4500’ elevation gain, in 9.5 hours round trip. We were pretty tuckered out, but very satisfied with the day’s outing. Overall a great day in my favorite mountain range. Map of the route, 16 miles and 4500' gain round trip. The trail wasn't always easy to follow. Making our way along the ridge. The impressive north face of WCP-2. Pat heading up, Lookout Mountain in the background. Summit view of WCP-3 and WCP-2. Me on the summit of my final White Cloud Wilderness Peak. Pat M photo. Victory shot on the summit of Wilderness Peak. Bendy section of Warm Springs Creek. Scenic creekside hiking on the way back. Map of the route, 16 miles and 4500' gain round trip.Start of the hike.Scenic Warm Springs Creek.The trail wasn't always easy to follow.Nearing the burn zone.Starting to head up.Making our way along the ridge.The impressive north face of WCP-2.Final stretch to the summit.Pat heading up, Lookout Mountain in the background.Summit view of WCP-3 and WCP-2.Me on the summit of my final White Cloud Wilderness Peak. Pat M photo.Victory shot on the summit of Wilderness Peak.Bendy section of Warm Springs Creek.Scenic creekside hiking on the way back.